Shortly after I posted the update about Chicken Little, Mama Hen decided it was time to start spending the night in the coop. Until then, she and Chicken Little had slept in the goats' hay feeder. She set about trying to coax Chicken Little to follow her into the coop. Doing this however, is a little trickier than simply walking through a little door. 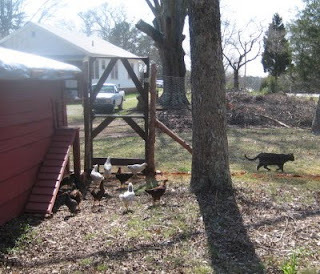 Because of the way the building was constructed (with diagonal bracing in the corners), we ended up having to build a couple of ramps to give chickens access to the outside. Mama Hen would go into the coop to the feeder, and cluck loudly in her best "I found food!" cluck. 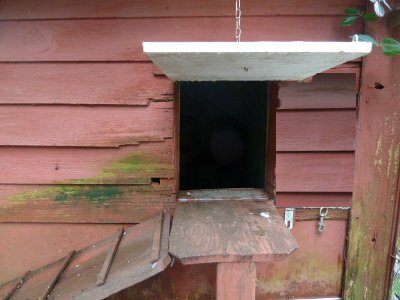 Chicken Little would peep like the dickens outside, but never ventured to even try to get into the coop. Was it because the ramp was so steep? Was it because the entrance was so dark & foreboding? Was it because there might be big scary chickens inside? Finally Mama just started spending the night inside the coop anyway, leaving Chicken Little to his (or her) own resources. Chicken Little decided the next best thing to Mama, was to roost on a goat. Well, I thought, this will never do. We already had one barnyard scandal ("Psst. Have You Heard The Latest?") because of a chicken who thought he was a goat. The only thing for it was to start putting Chicken Little to roost every night myself. 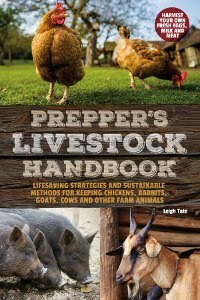 So for several nights, I would have to go catch Chicken Little to be carried into the chicken coop. Chicken Little had figured it out and gone to roost without help. One of the big chickens at last. Our set-up is why I tried to break Mama Hen's broody in the first place. Our chicken coop is half of an outbuilding that was here when we bought the place (see "The Chicken To-Do List"). It's worked well enough, but I am continually analyzing it with a view to replacing it someday. A coop that can accommodate brooding hens and baby chicks is on the drawing board, along with a new goat shed and milking parlor. I'll share our ideas with you soon. Can't wait to hear about all the plans! So glad she is with the big girls now! The big chickens will keep reminding the chick of it's low ranking in the flock but it is a natural thing which works out with time. It is good that you trained it to go in by itself at night. Now if only it isn't a rooster. Honestly, when I first read your title I was a bit worried that little chicken had taken a permanent dirt nap. I'm so glad this is just about being introduced to the flock and that little chicken is doing just fine. I'm probably wrong, but I thought that chickens like to be all crowded in for the night. How cute was this story. I'm so glad Chicken Little learned where his/her rightful place was but the picture of him/her on top of the goat was adorable. And such a sweet goat too to let the little chick "roost" on top! I'm also happy for the mother hen to have been successful at raising her chick. Great post! Jaclyn, those plans have been a long time in the making. :) Once a year we do a review and analysis. Hopefully we're starting to figure the animal situation out. Sunnybrook, so true. It's sad and annoying that they all chase and pick on Chicken Little, but like you say, it's their natural order of things. I'm hoping it isn't a rooster too! Renee, were you relieved? ;) Seems like chickens all like the top rung of the roost and will squabble over that. Usually all of them will spend the night on the top two. In winter, they do huddle together more. Bernadine, it's a relief to have Chicken Little make it so far. My big worry now is hawk migration, of which we're in the path. One has been hanging around quite a bit. Fortunately my chickens learned about hawks the hard way last summer. They know to stay undercover when one is nearby. 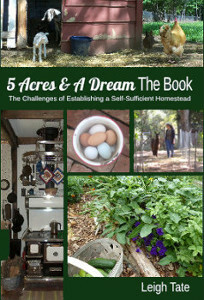 I read some place that it takes about a week for a chook to recognize it's "home" when moved. I guess you just proved it correct! It's nice to hear that things in the coop are good and happy. Aw... all grown up! :) What's the status of the guinea plan? You know, that's about exactly what happens with our broody hens / mama hens / chicks. They never want to go into the "big scary coop" and I hand-deliver them for a while, but eventually they catch on. Oh, and my goats seem to LOVE it when chickens roost on them. Weird. Debbie, the guineas will have to wait until next spring. This is mostly because of availability this time of year, though it's probably better because we'll have more time to prepare for them. Carolyn, isn't it funny how goats let chickens roost on them? A couple of my goats won't move when they have a chicken on their back. If I call they'll look at me like, "I'm occupied!" Barb, yea indeed! I've heard a lot of horror stories about blending, and had a horrible experience last year. So nice when things turn out well. Don't ya just love happy endings! What a smart Chicken Little . . . slow but finally "got it" in the end. It really doesn't take them long to learn the ropes - but that is some ramp! I would have been leery if I was in her place. I think I would have stuck with the nice, warm goatie! I was so worried when I saw the title that you had lost Chicken Little somehow. So glad it was a happy bedtime story! Yep, I think you caused several of us a little angst when we read the title of this post. So sweet that she sought out the nice, big warm goat as a surrogate mother when her own deserted her! Sometimes you fear they'll never catch on (going into the hen house on their own) but usually they do . . . with that little extra urging and hand-carrying. Awwww! That's so sweet. I love how accommodating the goat is. Crystal, the funny thing is that tonight, when I went to count chickens, I couldn't find Chicken Little. Found her out with the goats! In the dark! Janice, it's neat to see how they catch on. Chickens can learn indeed. Michelle and Mama Pea, I'm sorry I caused concern! It never occurred to me that night-night meant anything other than, well, going to bed for the night. So glad everything worked out for Chicken Little! Awww... Poor Chicken Little was a little chicken to go up the ramp. Hurray for chicken little! What a cute picture, roosting with the big girls....love it. Benita, LOL, I hadn't thought of that. How cute! They grow up so fast. Jody, it's amazing how fast they grow. S/he's almost as bit as the other chickens now.